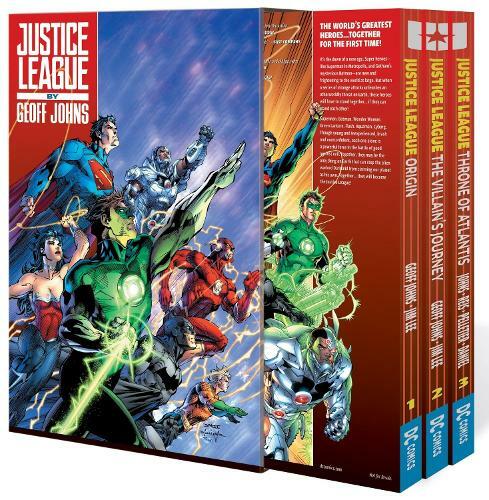 The first three collections of Geoff Johns' stellar run on JUSTICE LEAGUE are here in JUSTICE LEAGUE BY GEOFF JOHNS BOX SET VOL. 1, a slipcase collecting trade paperbacks from the all-star creative team, including legendary artist Jim Lee and fan-favorite Scott Williams. Don't miss the fast-paced action from the pages of JUSTICE LEAGUE VOL. 1: ORIGIN, JUSTICE LEAGUE VOL. 2: THE VILLAIN'S JOURNEY and JUSTICE LEAGUE VOL. 3: THRONE OF ATLANTIS. Collecting JUSTICE LEAGUE #1-17 and AQUAMAN #15-16.